(Nanowerk News) Some day, your smartphone might completely conform to your wrist, and when it does, it might be covered in pure gold, thanks to researchers at Missouri University of Science and Technology. Writing in the March 17 issue of the journal Science ("Epitaxial lift-off of electrodeposited single-crystal gold foils for flexible electronics"), the Missouri S&T researchers say they have developed a way to “grow” thin layers of gold on single crystal wafers of silicon, remove the gold foils, and use them as substrates on which to grow other electronic materials. 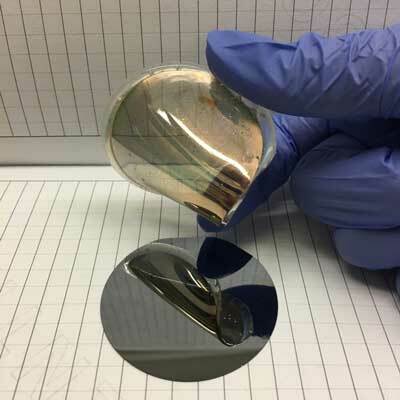 The research team’s discovery could revolutionize wearable or “flexible” technology research, greatly improving the versatility of such electronics in the future. According to lead researcher Dr. Jay A. Switzer, the majority of research into wearable technology has been done using polymer substrates, or substrates made up of multiple crystals. “And then they put some typically organic semiconductor on there that ends up being flexible, but you lose the order that (silicon) has,” says Switzer, Donald L. Castleman/FCR Endowed Professor of Discovery in Chemistry at S&T.